This image is Copyrighted by Chad Heckle and may not be used without express permission. 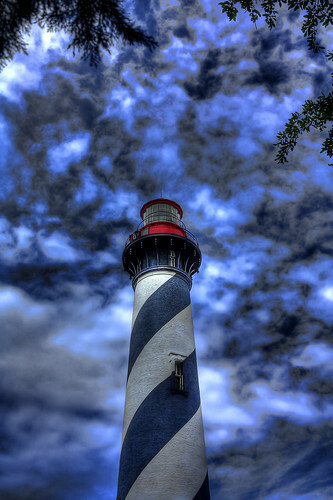 Built in 1824, the Saint Augustine lighthouse has guided ships to safety for 139 years. It also houses no less then 3 ghosts. I love this picture because it gives off that haunted surreal feeling to it. The really cool thing is that this lighthouse is actually miles away from the beach because of the Beach erosion and the changing geological aspects of the inland marshes and coastline of Saint Augustine. The awakening of St. Augustine. This is one that I took while on vacation with my wonderful wife down in St. Augustine, FL. I took this while standing on top of the wall that surrounds the moat of the Castillo San Marcos. The view is looking directly south down the Avenida Menendez. 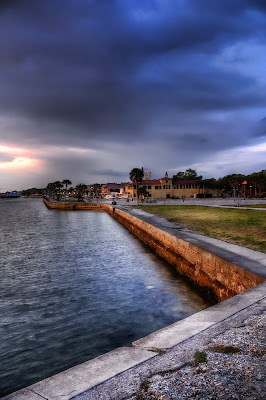 St. Augustine is a really cool town to visit. It is officially the OLDEST city in the U.S. Originally settled by the Spanish and under their control until the late 1700's when it was occupied by the British, and then the U.S. it was the staging point for the Spanish armada that invaded Saint Simons Island, GA (where I live now). However, they were defeated at the battle of Bloody Marsh here on St. Simons. 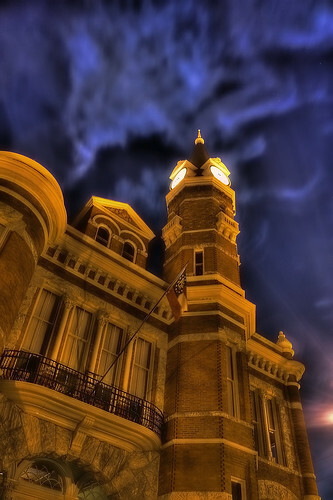 So another shot of the Old City Hall in Downtown Brunswick Ga. Not a place I'd like to be at for very long outside after dark with expensive camera equipment....no what I mean??? Anyway, I was out taking some publicity shots for my friend Heather's Ghost Tour publications, and figured I would try my hand at a nighttime HDR. What do you think? 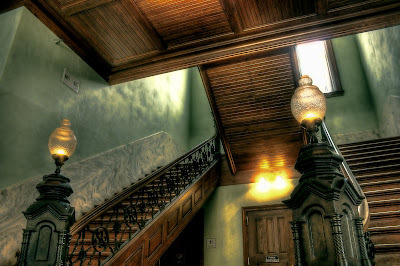 This is the stairway inside the Old City Hall in Brunswick, Ga. Back in the late 1800's, a man was arrested for slapping a black woman who supposedly used profanity at him (remember what time period this was in). When the judge ordered him to either apologize publicly or be sent to jail, the man refused. As he was being escorted down the stairs to the jailing area, the man pulled out a revolver from his vest pocket and shot three officers, one of which died from hi wounds. Officer Macy is said to still patrol these stairs even to this day. 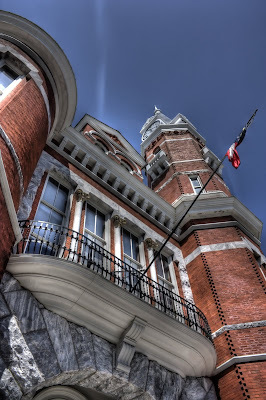 Built at a cost of $33,000, construction of the Brunswick City Hall began in 1886 and was completed in 1889. After temporarily closing for a restoration from 2000-2004, Old City Hall reopened in 2004 after the transfer of the seat of city government to a newer City Hall on Gloucester Street. The old city hall is the new home of the city commissioners. The clock tower was taken off in the 1950's after being damaged by storms, and was rebuilt from original drawings during the 2000-2004 restoration. I love the angle of this shot because its not your typical "postcard" publicity shot. 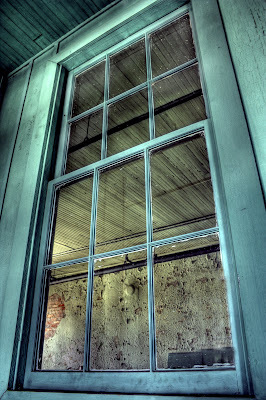 So here is another in the Abandoned series (actually two). The top one is of some storage that was left up there by the theater, I really loved the contrast between the colors and the newness of the sign compared to its surroundings. The bottom one I really liked the contrast in textures between the two rooms. I can't explain enough how cool these apartments were. To just think about the lives that were lived here, and what must have transpired here before it all went south. I was kind of hoping to come face to face with the ghost that roams these rooms...but too bad for me there was nothing, and nothing really turned up in my pictures either. Let mek now what you think! I have only been doing photography now for about 3 months. I am trying to get out there as much as possible and shoot as that is the best way to learn!! Pilly...A excellent photographer with some very emotional photographs. Definately check it out! All pictures on this site are the property of Chad Heckle and PM Photography.